Vatic Kuumba rode an electric scooter in downtown Providence. The Birds are migrating out of the Boston area. For now. Bird scooters, that is. The company that suddenly began renting scooters on the streets of Somerville and Cambridge in July has pulled out amid a game of bureaucratic whack-a-mole where the scooters kept reappearing after being removed by city workers. California-based Bird allows riders to rent free-standing electric-powered scooters off city sidewalks using a smartphone app. The scooters cost $1 per ride, plus 15 cents a minute. But Cambridge and Somerville charged the company violated city rules about blocking sidewalks and conducting business on public ways without a permit. Additionally, the cities contended the scooters themselves violated state law because they do not have blinkers or brake lights. 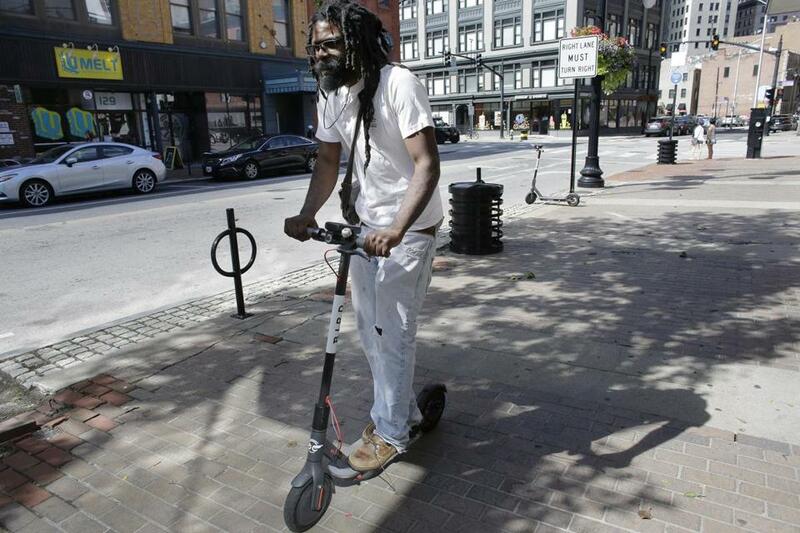 Bird and other scooter companies have run into similar problems across the country, as some cities have refused to allow them, while others have been more open. Bird developed a reputation for coming to cities unannounced and without local permission, though it has also pledged to share revenue with cities to help maintain roads. Cambridge and Somerville have each said they are open to the new form of transportation, but not without proper oversight. They’re worried, in part, about rider and pedestrian safety and sidewalk clutter. Bird requires users to scan a picture of their driver’s licenses into the app. And it notifies customers of Massachusetts law that requires riders to wear helmets and not operate on sidewalks. The scooters have not yet been deployed in Boston, though a few were ridden into and across the city. Mayor Martin J. Walsh has signaled he is skeptical of allowing scooters, though the City Council is planning a hearing of its own this fall. Somerville officials were not immediately available for comment.